<> on September 22, 2018 in Norfolk, Virginia. Early bye weeks cut this weekend's slate of local matchups in half, but there are big ones for both Virginia schools Saturday. WASHINGTON — Bye weeks are often a byproduct of the conference schedule, so most schools don’t have the option of when they take their annual hiatus. The September break always feels a little odd; we’re just getting into the rhythm of the season and learning what team we’ll see on the field before we have to take a week off. While Virginia (Oct. 6) and Virginia Tech (Oct. 20) have their byes next month, Maryland and Navy get to sit at home this week and evaluate a smaller sampler size. Maryland (3-1) has impressive wins over Texas and Minnesota outweighing the tough-to-explain loss at home to Temple. Causes for confidence include a running game that averages 6.2 yards per carry and a defense that has turned into a takeaway machine in the second halves of games. Causes for concern begin with the lack of a legitimate receiving threat and continues with the team committing too many penalties: the team’s 37 flags for 362 yards rank last in the Big Ten in both categories. Navy (2-2) has a pair of one-point games in AAC play. They’re very much in the West Division race, but after this start, none of their league games will be gimmes. Causes for confidence include the triple option offense that leads the nation in rushing (355.8 yards per game) while causes for concern include a defense that hasn’t held an opponent to fewer than 20 points yet this fall…as well as costly turnovers and special teams breakdowns. 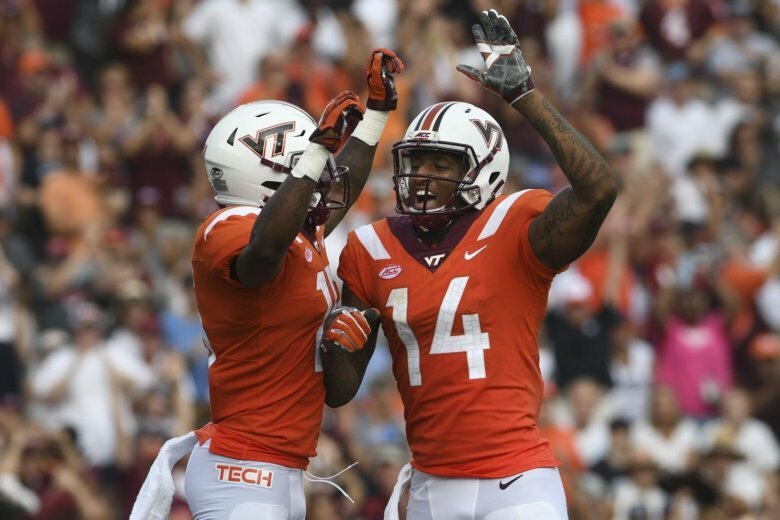 The Cavaliers’ defense is much improved this fall and Coach Bronco Mendenhall feels they’re making better in-game adjustments as well, allowing just 16 second-half points over four games. They’ll be hard-pressed to contain this week’s foe: Wolfpack senior quarterback Ryan Finley leads the ACC in passing yardage and NC State converts 58.5 percent of their third downs to lead the conference. UVa has also had issues on the road in league play lately, where the Hoos are just 2-18 since the 2012 season…when they went into Raleigh and beat the Wolfpack by 27. This is the first meeting between these two founding ACC members since that game, so Kippy & Buffy are going with the Founding Father-inspired “Federalist Bourbon Barrel-Aged Zinfandel.” The 2015 vintage possesses “aromas and flavors of black fruit, smoke, caramel and vanilla. “ Despite the portrait of university founder Thomas Jefferson’s rival Alexander Hamilton on the bottle, “the finish is long and smooth making this a thoroughly enjoyable wine.” Enjoy with aged cheddar on club crackers. Entering the season the secondary was a primary concern, which made the team’s shutdown of Florida State in Tallahassee all the more impressive. Since then, we’ve seen the Seminoles convert 1-of-14 third downs against a Syracuse team that allowed 42 points to Western Michigan, while the Hokie D earned an F in coughing up 35 second half points at Old Dominion. They also lost quarterback Josh Jackson with a fractured fibula in that game, so former Kansas QB Ryan Willis gets the start Saturday in Durham. The Blue Devils are also going with plan B at that position with Quentin Harris tossing six touchdowns to no interceptions in two starts after taking over for the injured Daniel Jones.